THE MINSTALLATION GALLERY RETURNS FOR ITS FINAL SEASON! ...And Cornel Rubino returns to the Creative Alliance to inaugurate this special arts event. Why do we cry? Our best efforts at understanding come from the realms of poetry, drama, fiction and cinema. Tears of happiness, tears of joy, tears of frustration and defeat. The tears of repentant politicians; the needs and demands expressed through an infant’s cries; the tearful hysteria of the masses over celebrity deaths. 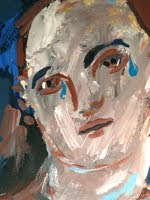 Cornel Rubino’s minstallation, CRYING, speculates on the mystery of crying, suggesting that it continues to resist explanation and interpretation and that the redemptive pleasures one experiences are reason alone to weep. A winner of awards including the Society of Publication Designers and Communication Arts Award for his work in The New Yorker magazine, Rubino’s 2003 drawing installation, MOBTOWN, covered 2000 sq ft in the Creative Alliance’s Main Gallery. Please join us on Saturday, September 12, from 5 - 7 PM to celebrate Cornel Rubino's minstallation, and to kick off the gallery's FINAL SEASON!